"A Hospital Where Kids Had Fun"
It was September 21, 1938. Strong winds ripped across the landscape of Starvegoat Island, tearing up bushes, destroying trees, and obliterating the summer cottages and dormitories perched precariously on the edge of Narragansett Bay. The hurricane-force winds tore the buildings, telephone and electric lines, water tower, and children’s sandboxes to pieces. A twelve-foot storm surge swept the debris away. Eighteen years of work turning barren Starvegoat Island into the Providence Floating Hospital Association’s “Sunshine Island” were erased in minutes by the Hurricane of ’38. The Providence Floating Hospital Association began in 1915, the result of a collaboration between wealthy women from a local church and concerned doctors. Providence, in the early twentieth century, was a gritty industrial city, rife with urban slums and overcrowded tenements brimming with malnourished children. Starting small, the association chartered a steamer and arranged for a carefully screened group of mothers and infants to go on a day-long cruise of Narragansett Bay. Mothers received a simple lunch and a lecture on proper child-rearing techniques, while nurses fed their infants sterilized formula. This experiment was deemed a success, and the Providence Floating Hospital Association was officially incorporated. The association initially funded their cruises through a city-wide junk drive, gathering automobile tires, hot water bottles, metal, rags, old feather beds, and false teeth, and announcing the presence of the collection truck with a bugler. By 1917, the association’s fundraising efforts focused on purchasing a large houseboat. They moored the new houseboat near Providence in Narragansett Bay, providing sunshine and medical attention throughout the summer for up to thirty infants at a time. By 1920, the Providence Floating Hospital Association had completely outgrown their houseboat, so when the owner of Starvegoat Island offered its use to the association, they enthusiastically accepted. 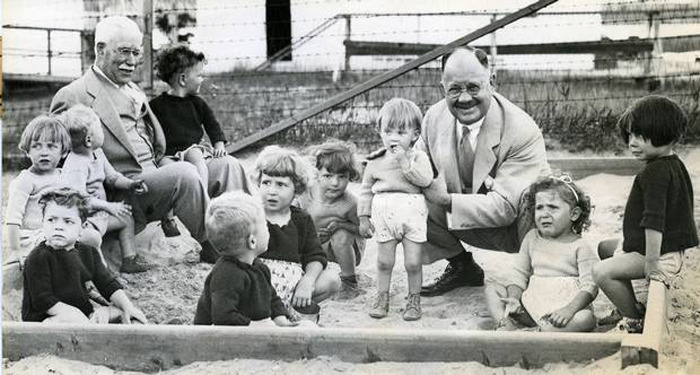 With the acquisition of “Sunshine Island,” the association decided to refocus its mission on children aged two through six since they required less nursing care than infants and might remain on the island for the entire summer. With the support of Providence citizens, the association constructed a new dormitory with more than one hundred beds on Sunshine Island. Later additions included running water and a telephone connection to the mainland. Both made life much easier for the island’s staff. The association used idyllic imagery to promote and publicize the program, particularly to wealthy Providence citizens who might offer financial support: “Under the influence of the salt breezes from the harbor, the clean living and wholesome food, children who might wither in the deadly heat of tenement districts are given a new lease of life and health by a stay at Sunshine Island.” The association clearly saw itself as capable of raising and nurturing the children in a way that their poor, uneducated, working-class parents could not. Parents sending their children to Sunshine Island relinquished much of their authority to the association. Only one afternoon a month was reserved for parental visits; the island was also open to the general public one day each month, to showcase the association’s positive work to potential donors. Following the devastation of the Hurricane of ’38, Sunshine Island stood desolate and bare. 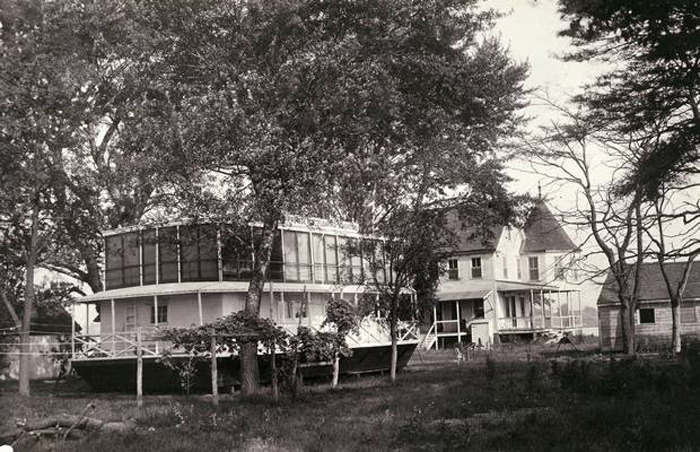 Rather than rebuild in the same location, the Providence Floating Hospital Association moved their base of operations to Warwick, where they continued to offer a summer retreat for children until the 1960s. Once filled with the noise and laughter of children at play, Sunshine Island was even used for a time as a landfill. Eventually, the narrow channel separating the island from Field’s Point on the mainland was completely filled, making it an island in name only. 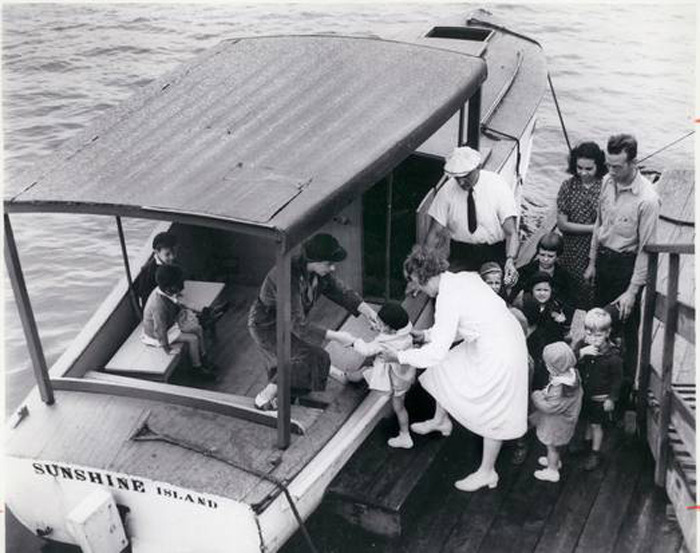 Sunshine Island Launch: By the mid-1920s, the Providence Floating Hospital Association acquired a small launch that was used to ferry children, staff, parents, and visitors from Field's Point on the mainland to the Sunshine Island dock. Prior to this, all trips across the inlet were made in a rowboat. The new launch increased access to the island, and the association capitalized on this asset by encouraging spectators from Providence to make day trips out to the island. 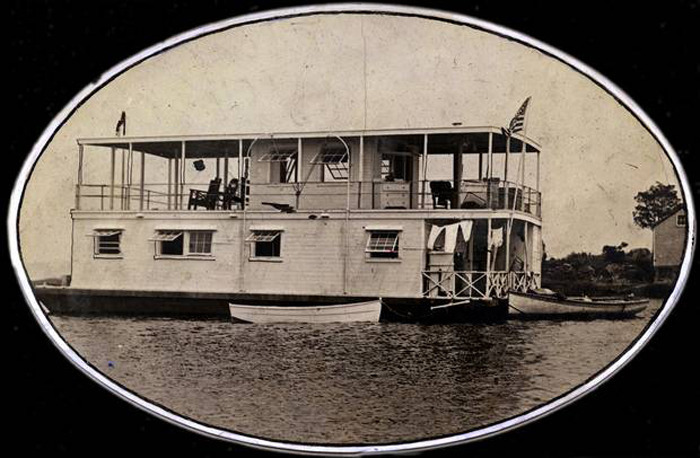 Providence Floating Hospital Association Houseboat: This photograph dates to between 1917 and 1920, when the Providence Floating Hospital Association's primary base of operations was a small houseboat owned by the association. After the association acquired use of Sunshine Island the houseboat was dragged up onto dry land and remodeled. It continued to be used until it, like all other structures on the island, was destroyed by the Hurricane of '38. Sunshine Island: This view of the island shows the Floating Hospital Association's old houseboat (left) after it was dragged onto land and refitted for use on the island. Children at Sunshine Island: No child was allowed at Sunshine Island if they were ill or could potentially spread a contagious disease. Instead, most of the children were simply undernourished, in need of hearty meals and fresh air. The Sunshine Island schedule was strictly regimented: children rose at 6 am, and with the exception of meals, they were outside playing all day until they retired for the night at 5:30 pm. 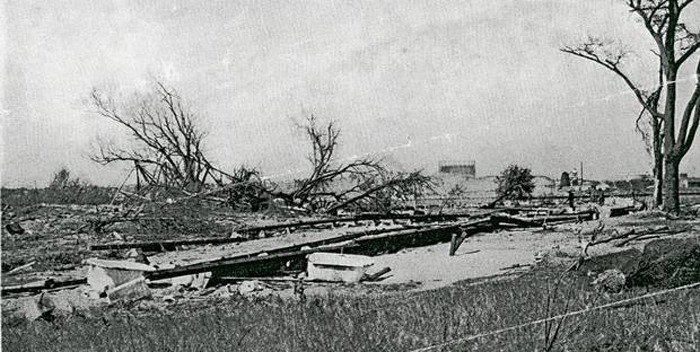 Hurricane of '38: The Hurricane of '38 brought widespread destruction across New England. At Sunshine Island, the unprotected buildings were inundated by the storm surge. The Floating Hospital Association's years of work were destroyed in minutes. Save the Bay Center: In 2000, Save the Bay, a Rhode Island organization devoted to protecting, restoring, and improving the ecological health of the Narragansett Bay region, began a massive capital campaign to reclaim Sunshine Island as the location of their new educational center. Designated as a contaminated brownfield site by the Environmental Protection Agency due to the site's use as a landfill and World War II-era shipyard, the site underwent significant remediation work. In 2005, the Save the Bay Center opened on the Sunshine Island site. Rebecca Soules, “"A Hospital Where Kids Had Fun",” Rhode Tour, accessed April 21, 2019, http://rhodetour.org/items/show/3. Byrnes, Garrett D. “A Hospital Where Kids Had Fun.” Providence Journal Magazine. September 26, 1971. “Floating Hospital.” Providence Magazine: The Board of Trade Journal 28 (1916): 81. “Floating Hospital Passes, Its Children Service Ends.” Providence Journal. November 25, 1962. “Hello, Sunshine Island.” Providence Journal. July 7, 1929. Simister, Florence. The Streets of the City: An Anecdotal History of Providence. Providence: Mowbray Company, 1968.